With 65% ECA exposure, LNG system payback time below two years is predicted for the smaller vessel sizes (using the standard fuel price scenario). For the 2,500 TEU vessel, a comparison of payback times for the scrubber and for the LNG system, and varying LNG prices, shows that the LNG system is attractive as long as LNG (delivered to the ship) is as expensive as or cheaper than HFO, when the fuels are compared on their energy content. For larger vessels typically operating at smaller ECA shares, e.g. the 14,000 TEU vessel, the LNG system has the shortest payback time (when the standard fuel price scenario is used), and the use of a WHR system further reduces the payback time. 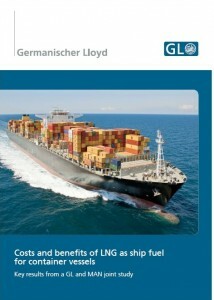 The price of LNG delivered to the ship is difficult to predict. Base LNG prices vary from the USA to Japan by a factor of four. European base LNG prices appear attractive at around 10 $/mmBTU even with small-scale distribution costs added. An LNG price of up to15 $/mmBTU could give LNG systems a competitive advantage against scrubbers in terms of payback for the smaller vessels considered in this study. Small-scale LNG distribution is just starting to become available in Europe (outside Norway) and it remains to be seen which LNG-fuel price levels will be established. The model to predict cost and benefits for LNG systems, scrubbers and WHR systems onboard container vessels offers extensive possibilities to study additional variants. Options include different vessel size, route profiles incl. ECA operation shares and other LNG tank configurations. Targeted analysis is offered on request. Download a copy of report here.